Principles of Finance Featured: Boundless Finance: "Chapter 8, Section 6: Diversification"
Boundless Finance: "Chapter 8, Section 6: Diversification"
Diversification relies on the lack of a tight positive relationship among the assets' returns, and works even when correlations are near zero or somewhat positive. Unsystematic or diversifiable risk is a term given to the portion of risk in a portfolio that can be diversified away by holding a pool of individual assets. Grandma wasn't telling you to grow up and be an omelet chef, she was actually giving you some sage advice that applies to your future as a portfolio manager. We have talked about diversification previously, and this section will follow from that. Remember, we talked about every particular investment having an expected return and a variance. If you are managing a pool of assets, you want to get positive returns without being in danger of "losing your shirt. " The probability that one stock goes belly up is much higher than that the whole stock market does. In finance, systematic risk is the term associated with risk that can be diversified away by investing in a broader pool of assets. Diversification relies on the lack of a tight positive relationship among the assets' returns, and works even when correlations are near zero or somewhat positive. On the flip-side, hedging is the tactic that relies on negative correlations among assets. Diversification comes with a cost associated with it, and some might point out that it is possible to over-diversify. The idea is that you can only diversify away so much risk, that the marginal returns on each new asset are decreasing, and each transaction has a cost in terms of a transaction fee and also research costs. At some point, it just isn't worth it anymore. The risk that can be diversified away is called "unsystematic risk" or "diversifiable risk. " Some investors like to call themselves fans of active or passive management. In fact, two of the biggest mutual fund managers–Fidelity and Vanguard–take opposite stances on this issue and use it as a selling point to customers. Proponents of passive management say the market knows best, and they seek a portfolio that has an underlying pool that mimics a benchmark index (think S&P 500). The other guys–active managers–believe that their fundamental analysis yields them a competitive advantage. They might decide Microsoft's stock is under priced based on changing demographics to the labor supply in Seattle, or they might decide that political stability has improved emerging markets in Sub-Saharan Africa but the yield on their bonds hasn't taken that into account. This debate is all held on the margins. Research has shown that there is a clear advantage in any portfolio to hold at least 30 different positions. In 1977 Elton and Gruber worked out an empirical example of the gains from diversification. Their approach was to consider a population of 3,290 securities available for possible inclusion in a portfolio, and to consider the average risk over all possible randomly chosen n-asset portfolios with equal amounts held in each included asset, for various values of n. Their results are summarized in the following table. It can be seen that most of the gains from diversification come for n≤30. Systematic risk is intrinsic to the market, and thus diversification has no effect on its presence in investments. Unsystematic risk does not factor into an investment's risk premium, since this type of risk can be diversified away. systematic or non-diversifiable risk is a term given to the portion of risk in a portfolio that cannot be diversified away by holding a pool of individual assets and therefore commands a return in excess of the risk-free-rate. Recall that previously we talked about the security market line and the implication that investors require more compensation for extra risk. 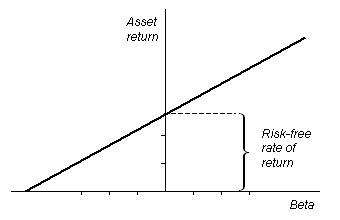 One might pay the same amount for a safe investment as for an investment carrying more risk; however, the riskier investment will, in theory, provide a higher return. This is the principle behind the security market line . Diversification is a technique for reducing risk that relies on the lack of a tight positive relationship among the returns of various types of assets. By diversifying a portfolio of assets, an investor loses the chance to experience a return associated with having invested solely in a single asset with the highest return. On the other hand, the investor also avoids experiencing a return associated with having invested solely in the asset with the lowest return -- sometimes even becoming a negative return. Thus, the role of diversification is to narrow the range of possible outcomes. Diversification theory says that the only risk that earns a risk premium is that which can't be diversified away. As a result, the portion of risk that is unsystematic -- or risk that can be diversified away -- does not require additional compensation in terms of expected return. For example, consider the case of an individual who buys 50 corporate bonds from a single company. The individual receives a certain yield based on the purchase price. However, if unexpected business risks lead to liquidity problems, the company might go bankrupt and default on its loans. In such a case, the investor will lose the entirety of the investment. Conversely, if the investor buys a single bond from 50 different corporations who have similar credit ratings, then one instance of insolvency will have a far less drastic effect on the investor's portfolio. ◄ Boundless Finance: "Chapter 8, Section 2: Portfolio Considerations"